This coach is one of the ex North London Railway coaches that ended up in service on the Isle of Wight and subsequently was preserved on the Isle of Wight steam railway. It is a single piece 3D printed shell which fits a Peco 15' chassis. Set of easy build etches to produce a four coach rake of 1873 Stroudley coaches as used on the Isle of Wight until the 1930s. The kit builds two brake ends with duckets, a first (used on the IoW as a composite) and a third. 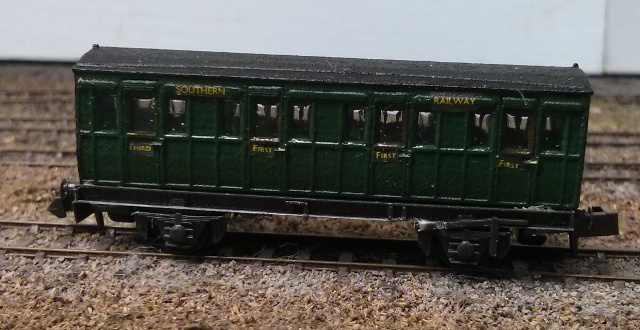 Fits four peco 15' wheelbase wagon chassis with most brake gear removed (not included). This kit is primarily designed to build the coaches in later condition. The roof is marked out for ventilators rather than oil. Both types of duckets are now included in the kit. The roof markings are half etched so that oil lamp holes can be drilled instead.